With the wind whipping, temperature dropping and snow accumulating, I spent much of the last two weeks nesting in my cozy (and at times tropical) fifth floor walkup. By Wednesday, however, cabin fever started to set in, and I knew I needed to take a trip up to Chelsea Markets, specifically, to Dickson’s Farmstand Meats. That’s right: I had meat on the mind, specifically, bacon. After I regained the feeling in my fingers and teased the snow out of my hair, I moseyed on over to the butcher counter to make my selection. I settled on a quart of Master Stock, made from beef, duck and pork bones, two pounds of cubed beef chuck shoulder, the perfect centerpiece for a winter’s stew, and one pound of choice-cut of thick, smoky bacon to act as the ultimate in decadence—the garnish for my meaty one-pot meal. Now here’s what you need to know about Dickson’s: not only is their bacon so utterly delicious I can’t help but eat it raw, their stock is the most flavorful, gelatinous goop on the market (which I dare say is better than my own! ), and their beef is as tender and fresh as it comes, but what’s more, all of their meat is also locally sourced and humanely raised. What could be better than that? As I left the sanctuary of Chelsea Markets bundled up to once again face the elements, I was momentarily distracted from the Buffalo-like weather and emboldened by the thought of the sweet, earthy bacon in my bag. Feeling particularly like dinosaur kale, I decided to head over to the Union Square Farmers’ Market to select vegetables to round out that night’s pork-tinged pot of meat. By the time I made it across town, the howling winds had sufficiently reminded me of the reasons for my recent stint as a homebody, and I stood, amazed, that there was even any produce there at all. I knew I needed particularly hardy vegetables, something extra fortifying and strong that would not only stand up to my bacon but to the trip back to my apartment as well. At that moment I spotted a stand of rutabagas. This often-neglected root vegetable (it’s a cross between a turnip and a cabbage) is loaded with potassium and vitamin C, making it a nutritional powerhouse that would be a much-needed health booster after my day of wandering around New York City in the dead of winter. 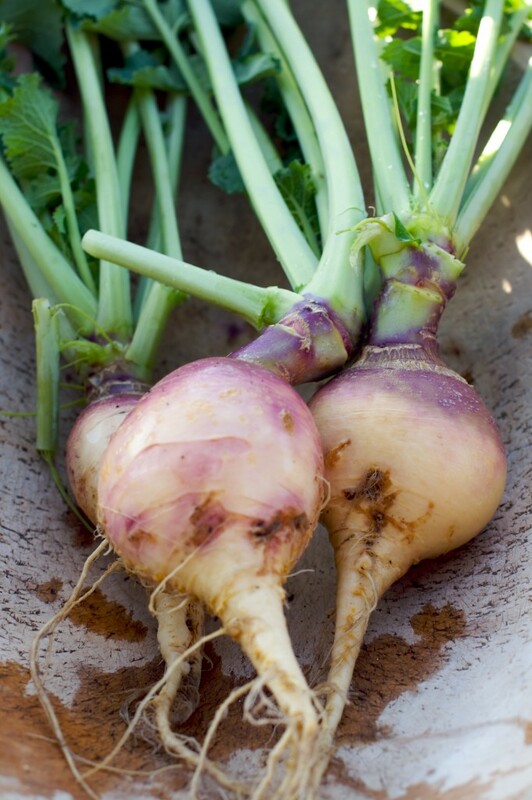 Their purple and white mottled skin, covered with a protective wax coat, hides a smooth, creamy interior that can be boiled, roasted, pureed, or fried. In this case, I planned to sauté them in butter and thyme before adding them along with my other markets finds—potatoes, carrots, mushrooms and horseradish—to the pot that would be simmering atop my stove in a matter of minutes. One last stop at the wine store for two bottles of Burgundy (one for the pot and one to get potted), and I was back home. Using Tyler Florence’s recipe for The Ultimate Beef Stew as my guide, I threw my own flourishes into the pot and settled into three hours of mouth-watering suspense as my apartment grew swollen with the smell of stew. It was worth waiting for. Giving stew, soups and casseroles enough time to reduce, condense and solidify flavor is the trick to one-pot meals. Think low & slow! 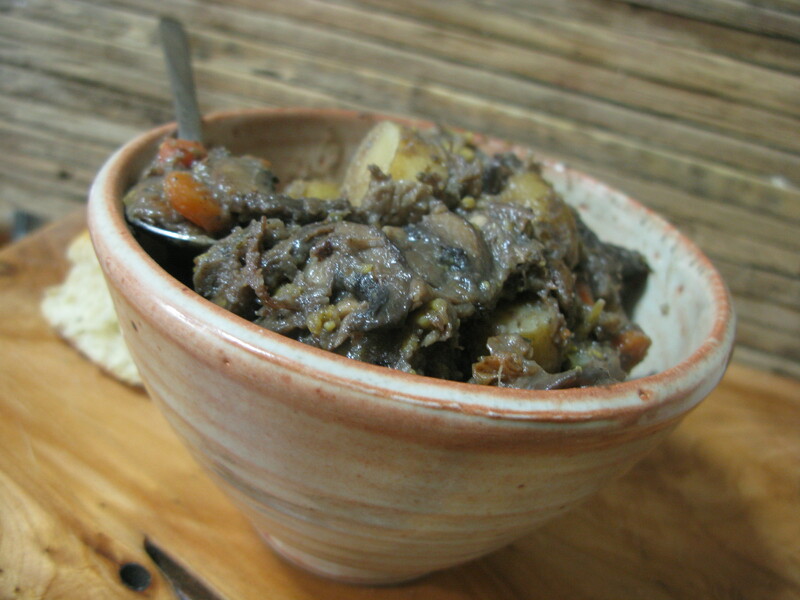 Just like BBQ, stew benefits from slow cooking over a low flame. It also benefits from crunchy bacon bits sprinkled over the top of your brown bowl of not-so-pretty but seducingly-soul-satisfying supper. But then again, what doesn’t?